Give space to the volumes in perfect vintage style. Let you influence by the "voluminous" sophisticated and sensual icons of the cinema and jet set such as Jacqueline Kennedy, Grace Kelly, Claudia Cardinale and Brigitte Bardot. 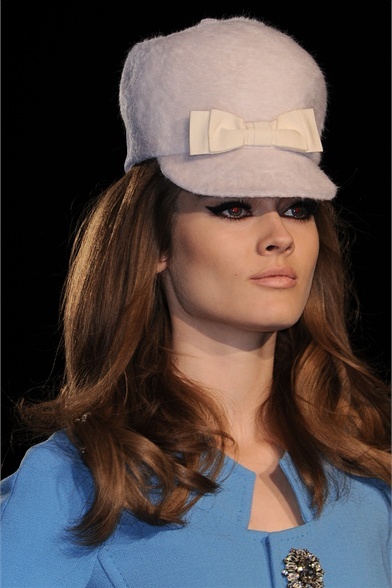 For a vaguely bon ton effect, create a fake blunt cut by rolling the ends at the neck, then embellish with a ribbon, a band or a little diadem, it depends on the occasion, on your mood and on your personal style (Moschino Cheap & Chic). If you have a rock spirit, backcomb only the upper part of your head, leave flats the temples flat and free the lenghts (John Richmond). For a special evening, try the balloon look: remember, volume is everything. Push back the roots and wear an headband, leaving the backcombing to make a halo. Finally, collect lengths with a ribbon in a high ponytail (Oscar de la Renta). Largo spazio ai volumi accentuati vintage style. Ad influenzare il trend delle "cofane" icone del cinema e del jet set sofisticate e sensuali del calibro di Jacqueline Kennedy, Grace Kelly, Claudia Cardinale e Brigitte Bardot. Per un'aria vagamente bon ton, crea un finto carré arrotolando su se stesse le punte all'altezza del collo, impreziosisci poi con un fiocco, un nastro oppure una coroncina a seconda dell'occasione, dell'umore e dello stile personale (Moschino Cheap & Chic). Se lo spirito è rock, cotona solo la parte superiore della testa, lasciando piatte le tempie e libere le lunghezze. Per una serata importante, c'è lo stile balloon: il volume è tutto. Tira bene le radici ed infila un cerchietto, lasciando la cotonatura a far da aureola. Infine, raccogli le lunghezze con un nastro in una coda alta (Oscar de la Renta). 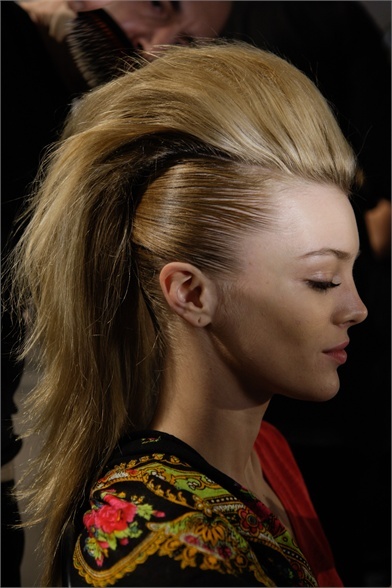 Love the voluminous vintage hairstyles, but I imagine it would take an entire bottle of hair spray to hold it up! Condivido! Io la testa me la sono addirittura cotonata con un taglio di capelli per quest'inverno! Bacio! Hey hun! I love the blog! Would you maybe like to follow each other? Please let me know so I can follow you too! Amo i capelli cotonati. Se trovassi una festa per farmeli, non esiterei..ne ho così tanti e grossi che si prestano benissimo! Bellissimo questo stile, ci starebbe anche con i miei capelli! Adoro adoro adoro la prima e la seconda foto! I adore this sixties look!!! Brigit Bardot is iconic of that era and I love her!! I love this post! The hair is great and I've tried this but I can't do it like this! Great blog too! I love voluminous hair!! Great inspirations! I loved all the looks! esp.the 1st one. Everything is so elegant - loving the hairstyles too! non sono affatto facili da portare... preferisco gli abiti rispetto alle acconciature su di me! Hi there, thank you for your comment today! so sixty!! i love the eyeliner! Amazing pictures I loooove their hair ! Gorgeous photos! love their make up! Love the mod '50s look! The big hair and cat eyes are so glamorous! Che bella quell'aria bon ton, le acconciature sono bellissime, poi adoro i nastri nei capelli.. I love the makeup so much on these photos, especially the first one. Absolutely gorgeous!